He bemoaned the fact that the existing education system had overshadowed the basic human nature with an extreme materialistic attitude and culture. Lobsang Tenzin Negi, Professor and Director, Emory-Tibet Partnership made a presentation on ‘Values and Necessity of Secular Ethics in Education’ to set the stage for the discussion. 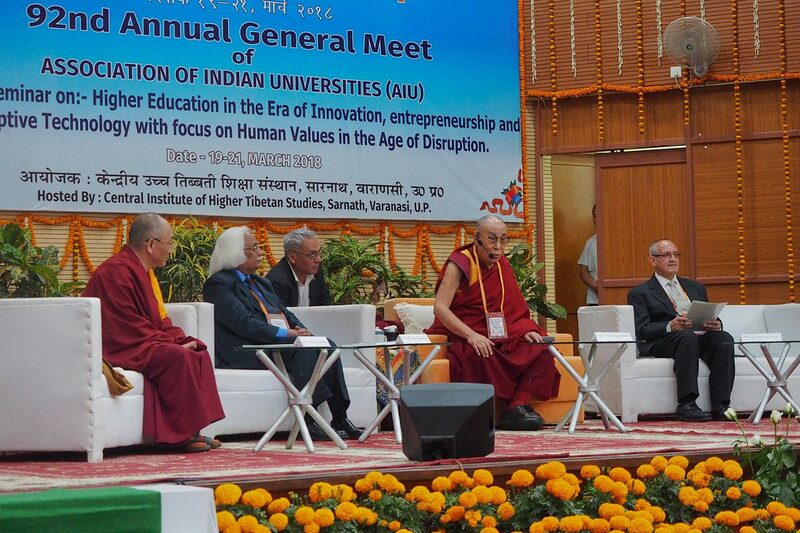 Professor Pritam B Sharma, President of Association of Indian Universities, spoke on the relevance of the Dalai Lama’s message and called upon the Vice Chancellors and others attending the meet to heed his message. And Professor Girishwar Mishra, Vice Chancellor of Mahatma Gandhi Antarrashtriya Hindi Vishvavidyala, informed the seminar that the Dalai Lama had made it very clear that a vast gap had arisen between real human nature and education, that “we have forgotten our true nature and we have considered all the attachments as indicators of true natures”. On a proposal by President Sharma, all the Vice Chancellors attending the meet decided to institute a centre for secular ethics, professional morality and scientific values, in their universities as initiatives for better, sound and healthy education. About 150 Vice Chancellors of Indian Universities, besides academics and scholars from across the world attended the meet.